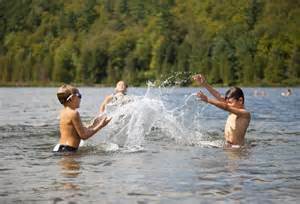 Unlike swimming at a pool, water conditions in lakes can be unpredictable. You often have to share the lake with boaters, water skiers and other recreational vehicles. Lake bottoms are often uneven with sudden drop-offs into deep waters. You may have to contend with fish, seaweed, rocks and other debris. Wearing water shoes can help with this as well as staying in shallow water. Swimming only in designated areas is also recommended. – Check for cell phone coverage, both before you leave shore and after you get out on the water. Keep your cell in a water proof container or compartment. Make sure you have enough life jackets on board for everyone. Children should wear life jackets at all times. Georgia made it a state law in 2013 for children under 13. Keep some distance from other water vehicles. Georgia law requires you to be in idle mode whenever you are within 100 feet of another vessel. For a complete list of boating regulations, check out the Georgia Department of Natural Resources. It’s also very easy to get lost on this lake, especially with all its nooks and turns. Be aware of your location at all times. You should also have a good idea of how long it will take you to get back to your boat ramp or marina. Most boats are not equipped with the proper lighting to be on the water at night, so it’s best to be off the water before dark. Anyone age 16 or over is required to have a fishing license in the state of Georgia and to have it with them when fishing. You may be asked to show the license while fishing. These can conveniently be obtained online and printed out yourself. The cost is less than $15 per person. Lake hazards can also come from the weather. Be sure to check the weather report before heading out to Lake Allatoona. Bad weather can develop quickly in metro Atlanta. Leave the water at the first sound of thunder and don't re-enter the water until at least 20 minutes after the last clap of thunder has passed. In the event of lightning, leave the beach area completely. While Lake Allatoona can be a fun way to spend the day, always be mindful of your surroundings, whether on shore or out on the water. See you at the lake!